Carnival Corporation will be launching four cruise ships in 2019 across three of their cruise line brands: Carnival Cruise Line, Princess Cruises, and the largest European cruise operator – Costa Cruises. Everyone will get a preview of one of the ships when Carnival debut a floral replica of Carnival Panorama at the Rose Parade on New Year’s Day in California. Panorama will be the company’s first brand-new ship based in California in 20 years, and is scheduled to begin sailing from Long Beach in December 2019. A replica of Carnival’s AirShip blimp will also be included in the parade float, flying above the cruise ship. The other new vessels include Princess Cruises’ fourth Royal-class ship, Sky Princess, and two for Costa Cruises: Costa Smeralda which will be powered by liquefied natural gas in port and at sea, and Costa Venezia, which has been designed specifically for the China market. Carnival Panorama will build on the success of her sister ships, Carnival Vista and Horizon. She will feature the tropical Havana cabins and exclusive bar and pool area, Family Harbor staterooms with a private lounge, a massive WaterWorks aqua park, and the line’s newest feature – the first-ever trampoline park at sea – created with Sky Zone. Panorama will sail year-round from Long Beach on Mexican Riviera cruises. Sky Princess will carry 3,660 guests and include the best of the features found on the other three Royal-class ships – Royal, Regal, and Majestic Princess. New to the ship are Sky Suites, centrally located on the top deck with massive private balconies with a prime view of the ship’s outdoor movie screen. Sky Princess will also include a Wakeview pool on the aft, two new deep-tank top deck pools, a Retreat Pool, and more hot tubs than previous Royal-class ships. The ship will debut with Mediterranean voyages in October 2019 before heading to Fort Lauderdale in November 2019. Costa Smeralda will reflect the best of Italy, and be the line’s first ship to be powered in port and at sea by liquefied natural gas. The heart of the new flagship will be a three-level domed Colosseo lined with themed lounge bars. Smeralda will also host an onboard museum, dedicated to the excellence of Italian design. Weighing in at 182,700 tons, the vessel will be the largest in Costa’s fleet. She debuts in October 2019 and will sail in the Mediterranean. 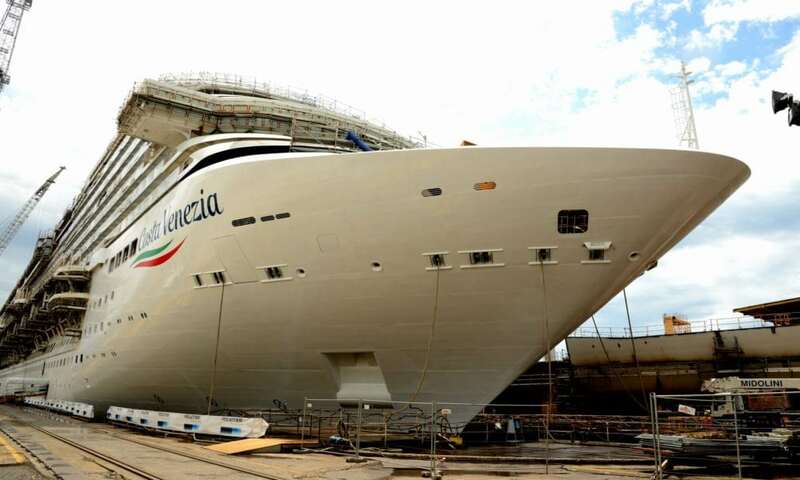 Costa Venezia will debut in March 2019 and has been designed and built just for the China market. Passengers will be able to enjoy fine Italian dining, shopping, and entertainment while enjoying familiar comforts such as a variety of Chinese cuisines and Chinese-style karaoke bars. The atrium on the 5,260 passenger ship will be modeled after Piazza San Marco. European and North American guests will be welcomed onboard for the March 3, 2019 voyage from Italy to Greece and Croatia, followed by a 53-day inaugural cruise on March 8 sailing along the route once explored by Marco Polo and ending in Shanghai, China. The ship will be dedicated to Chinese guests beginning May 2019.